Police identified the remains of a child discovered in Texas as the missing 3-year-old Sherin Mathews, according to Fox News. Earlier today, it was revealed that the girl’s father claimed that she choked on her milk and “believed she had died,” changing his initial story that he asked her to go outside as a form of punishment for not drinking her milk. According to an arrest warrant for Wesley Mathews obtained by local news outlets, the details of the conflicting story led to his arrest on Monday evening. Police in Richardson confirmed his arrest on Monday, Oct. 23. Mathews alleges that he’d been trying to get the 3-year-old child to drink the milk in the garage at 3 a.m. and “physically assisted” her in drinking the milk when she wouldn’t listen, WFAA reported, citing the arrest warrant. Mathews then admitted that he removed her body from his home. Originally, after she disappeared Oct. 7, he said that he told her to go outside and stand near a tree at 3 a.m. as punishment for not drinking her milk. He was then arrested on charges of felony endangerment to a child and was placed on electronic ankle monitoring before he bailed out of jail. He was re-arrested on Monday for felony injury to a child after telling officials at the Richardson Police Department the conflicting new details. 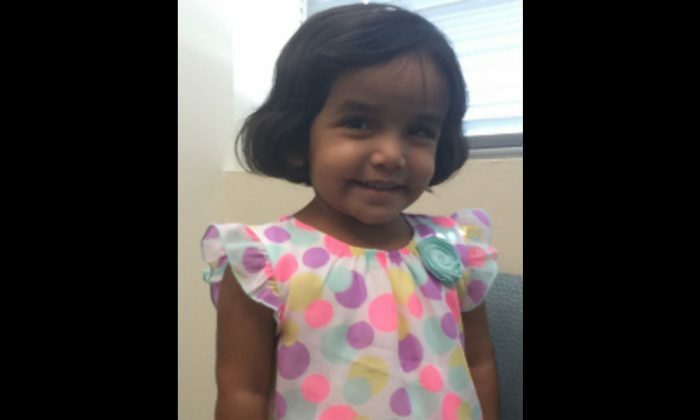 “When they came in, they provided us with some information that was contrary to what we had previously been told regarding her [Sherin Mathews] disappearance,” said Kevin Perlich, who is a Richardson Police Department spokesperson. “It is possible that he could bond out again,” Perlich said, WFAA reported. His bond has been set at $1 million and he was taken to the city jail. He wouldn’t elaborate on the details on the original story Mathews told police. “It was not what he told us originally,” Perlich stated. The body of a child was found in a culvert on Sunday morning, and police believed it belonged to the girl before it was identified today. Wesley Mathews and his wife Sini Mathews on Monday attended a court hearing to determine whether they could regain custody of their biological 4-year-old daughter. Sherin was adopted from India after she was abandoned by her biological family, according to the Times of India. Reports say she was developmentally disabled and had difficulty communicating.